The wiring of the olfactory system, which controls the sense of smell, gets set up shortly after birth and then remains stable but adaptable. To accommodate a lifetime of scents and aromas, mammals have hundreds of genes that each produce a different odorant receptor. The complex and diverse olfactory system they build remains adaptable, but a new study in the journal Science shows that the system’s flexibility, or plasticity, has its limits. Working in mice, Brown University scientists found that the fundamental neural wiring map between the nose and the brain becomes established in a critical period of early development and then regenerates the same map thereafter. The findings not only reveal a key moment with lifelong consequences in the development of a vital sensory system, but also may provide a “heads up” for bioengineers and doctors looking to develop regenerative therapies for the central nervous system. As flexible as the brain is, it also has mechanisms—at least in the olfactory system —to ensure that the connections established early will be maintained for life. “Our experiments enabled us to reveal that the system has some ‘memory,'” says Gilad Barnea, assistant professor of neuroscience at Brown University and corresponding author of the study. Lead author Lulu Tsai, now a postdoctoral fellow at Drexel University, conducted the experiments under Barnea’s supervision while she was a graduate student at Brown. Tsai and Barnea sought to track the development of sensory neurons that express an odorant receptor, MOR28, through space and time in the mouse olfactory system. They did so by engineering a version of the receptor that could be expressed or suppressed at key developmental times. Neurons that express the engineered version of MOR28 would glow red under the microscope. In addition, the researchers tweaked the native version of the receptor gene such that neurons that express it would glow green. In a typical mammalian olfactory system, neurons expressing a receptor gene like MOR28 will be found randomly sprinkled around the lining of the nose, but their long, wiry axons will all connect to just two symmetrical pairs of structures called glomeruli within the brain’s olfactory bulb. The glomeruli relay odor signals to the rest of the brain. Barnea and Tsai’s mice developed similarly, with most native MOR28-expressing neurons connecting their axons into the typical glomeruli during early development. But when the researchers let the engineered MOR28 become expressed, those connected into other nearby glomeruli. Significantly, native MOR28 axons sometimes ended up becoming rerouted to these alternate glomeruli with their engineered brethren. Under the microscope, green mixed with red. It’s a novel finding that some engineered MOR28-expressing neurons could reroute native MOR28-expressing neurons to join them outside the standard four MOR28 glomeruli. It suggests that olfactory neurons influence each other during early development as they find their way to glomeruli and don’t, as current neurodevelopmental models suggest, do so autonomously. But the main finding of a critical period where wiring becomes locked in came about as Tsai controlled the timing of engineered MOR28 receptor expression. She induced that on the day some mice were born, a week later in other mice, and two weeks later in still others. In mice where engineered MOR28 expression was allowed at birth, one in nine mice showed rerouting of native MOR28 axons to glomeruli with engineered MOR28. A week out only one in 17 mice showed any rerouting. After two weeks it never happened. “We conclude that there is a critical period for the formation of rerouted-MOR28 glomeruli that ends at birth or shortly thereafter,” Tsai and Barnea report. The researchers also looked at this in other ways. In one experiment, they found that they didn’t need to maintain expression of the engineered MOR28 for the rerouted connections to persist into adulthood. Once established, they remained. They also tested whether the rerouting seen in developing mice could occur in adults. They let native MOR28-expressing axons grow alone, and then wiped them out. Then they let native and engineered MOR28-expressing neurons regrow fresh connections to the olfactory bulb together when the mice were adults. They never saw rerouting in the adult mice as connections regrew, suggesting that the ability to reroute is lost in adulthood. 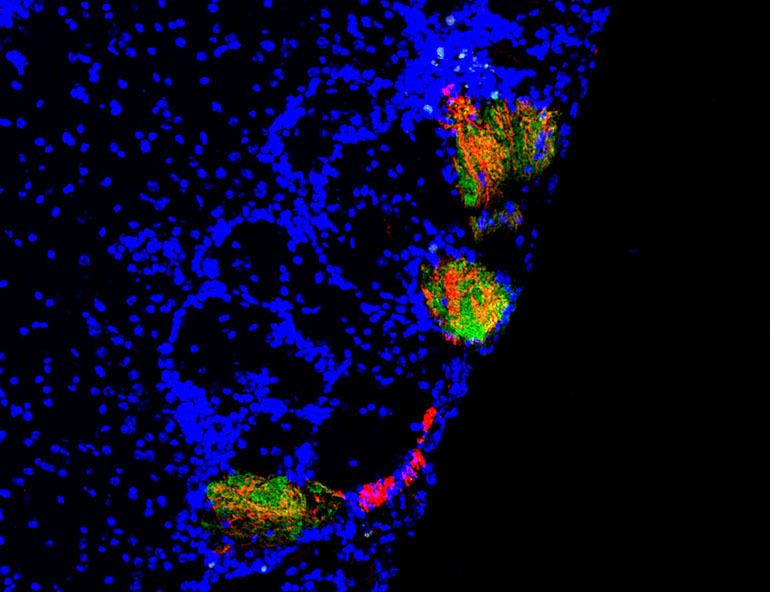 In yet another experiment, they found that if they let rerouted glomeruli become established and then wiped out olfactory neurons, the regrowing connections would return to the rerouted glomeruli even when the engineered receptor was no longer expressed. So although adults can’t create new rerouted glomeruli, they will restore existing ones. All of the experiments together showed that the fundamental wiring diagram of the olfactory system is laid out and implemented early in life. Whatever pattern is established then stays there for life. These observations suggest that the course of early development has lifelong consequences, Barnea says, providing insight into understanding of neurodevelopmental and psychiatric disorders. These observations may also have implications for regenerative medicine, Barnea says. Once neural circuits are established, it may be difficult to induce subsequent fundamental alterations to them. On the other hand, learning more about the differences between early development and the adult system may help to devise better regenerative strategies. “It is clear that there is much more for us to learn about the development of neural circuits,” he says. The National Institutes of Health and the Pew Scholar in the Biomedical Sciences program supported the research.